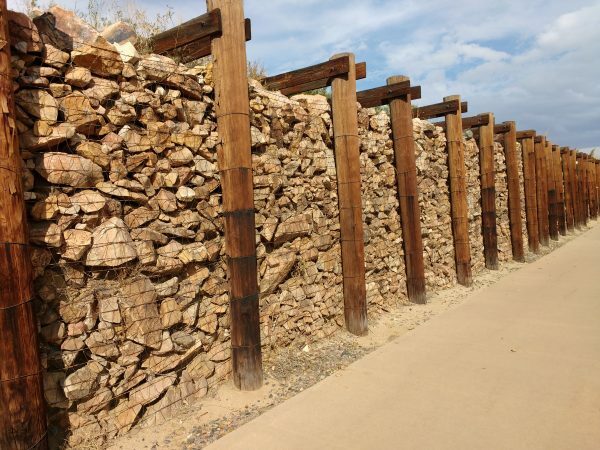 Free high resolution photo of a gabion rock and timber retaining wall. A gabion is a cage or box filled with rocks, dirt or other debris used in construction. The word comes from the Italian gabbione meaning big cage. This picture shows a retaining wall built using a gabion construction technique. There are large vertical timbers as big around as telephone poles providing structure to hold the rock filled cages in place. This photo was shot along the Sand Creek trail in Denver, Colorado. Free image for any use.